On Wednesday, February 9th, 2011 the Solar Peace Sculpture was erected at the Campus of the University of Saarland. A very powerful piece of art indeed. Standing 58 feet high, the sculpture is constructed from 80 oil barrels, with a solar energy panel attached to each barrel. 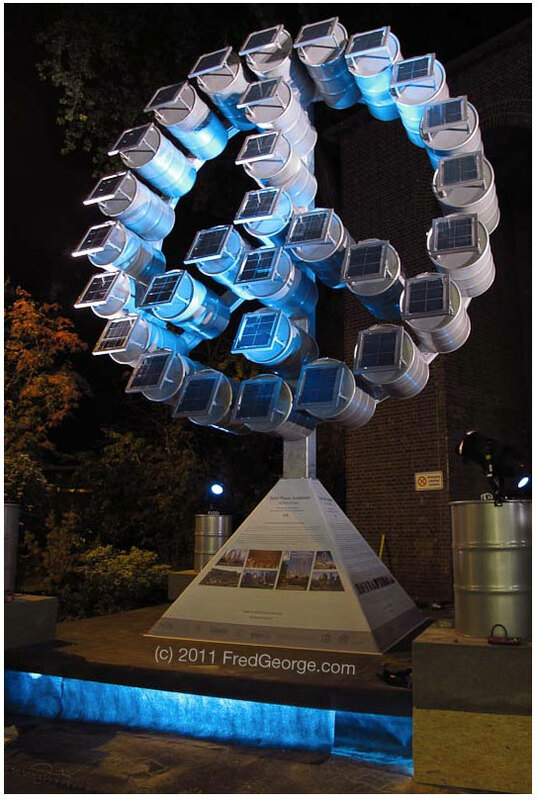 The sculpture fabricates a sustainable resource that feeds back into the city´s electrical grid. At a time when we have never been more dependent on oil for our daily transport, this donation of energy delivers a message of environmental responsibility and social pride. Symbolically, this piece of art represents a call to the world that the time of sole reliance on fossil fuel is running out. The human casualties, stemming from the oil wars, will only increase if we do not embrace alternative energy. Employing solar power is an obvious solution. Sometimes art says what needs to be said better than any amount of words. Today’s MotD reminds us that when words fail us, express it creatively.